Wahama senior Dalton Kearns (23) delivers a pitch during of the White Falcons’ 10-8 victory over Trimble on Monday in Mason, W.Va.
Wahama junior David Hendrick (28)awaits the throw during an attempted steal by a Tomcats runner Max Hooper (12) during the White Falcons’ 10-8 victory over Trimble on Monday in Mason, W.Va.
MASON, W.Va. — Cashing in on conference victories early can pay dividends later in the season. 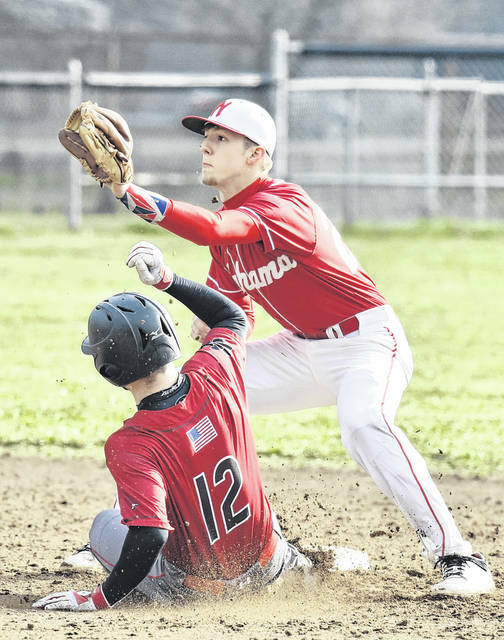 The Wahama baseball team soared to a 5-1 lead through the two innings, but the visiting Tomcats rallied to make the game a close encounter as the White Falcons held on for a 10-8 victory in a Tri-Valley Conference Hocking Division contest on Monday night in Mason County. Trimble (1-1, 1-1 TVC Hocking) leaped to a 1-0 advantage in the top of the first inning, as Max Hooper wrapped a two-out double to left field and later scored on an error at third base off the bat of Noah Rossitter. Wahama (3-0, 1-0) countered in the bottom half of the first frame, as the hosts sent nine batters to the plate and scored three runs on four hits to take a 3-1 lead. The White Falcons added two more runs in the bottom of the second inning, as Dalton Kearns reached base to lead off for a second consecutive frame and scored when David Hendrick followed with a double. Hendrick then reached home when Tanner Smith followed with a single to extended the advantage to 5-1 in favor of the hosts. The Tomcats cut the deficit to 5-3 in the top of the third frame, as Landon Wisor by way of a double steal that moved Hooper — who had reached base on a two out walk — to second base. Hooper later scored on a single by Rossitter as the visitors sent eight hitters to the dish in the inning. The Red and White added three runs in the bottom half of the third, as Peters, Kearns and Henrick each scored in the frame to extend the lead to 8-3. Trimble countered in the top of the fourth, as a two out walk to Cameron Kittle followed by a single Tyler Roback, provided RBI opportunities for Hooper and Rossitter. The back-to-back singles helped the visitors cut the deficit to 8-5 as play entered the bottom of the fourth. WHS added a run in its half of the frame, as Anthony Ortiz singled with one out and later scored on a double by Johnathan Frye to push the lead to 9-5. Both teams scored a run in the fifth, but held each other scoreless in the sixth inning as the game stood at 10-6 entering the finale. Drama ensued in the top of the seventh inning, as Connor Wright led off with a walk and two outs later Young joined him on the bases also by way of a base on balls. Wisor followed with a single to load the bases, as Kittle continued the inning with a single to score Wright and cut the deficit to 10-7. Trimble closed the gap to 10-8 when Roback walked to force in Young from third base. Wahama closed out the two run victory in the next at bat as Hooper hit a pop fly handled by White Falcons relief pitcher Hendrick. Kearns was the winning pitcher of record for WHS, as he allowed four runs on four hits, with two walks and eight strikeouts. Antonio Serevicz pitched two and two-thirds innings of relief and surrendered three runs on three hits, with three walks and four strikeouts. Hendrick appeared in one-third innings of relief and surrendered one run with one walk. Smith and Hendrick each finished with three hits to lead the White Falcons, as Arrington and Ortiz followed with two safeties apiece. Peters, Hunt, Frye and Kearns rounded out the hit totals for the Red and White with one safety each, respectively. 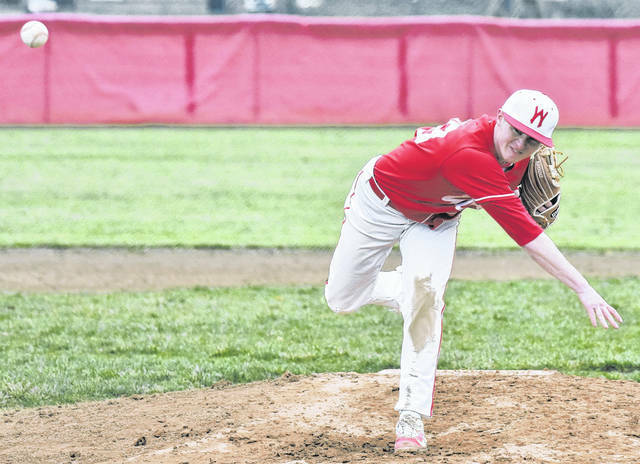 Following the game, Wahama head coach Billy Zuspan was pleased with his team’s effort — particularly with earning its first conference victory of the 2018 campaign. Wahama returned to action on Tuesday as they traveled to face Waterford in a TVC Hocking contest.